Excellent architectural shot - well done! great one, but what is the story behind this photo? Enhorabuena tio! Te has llevado la cámara?? That is perfection. A well deserved win. Congratulations!!! It’s a fine photograph! A great capture! Congrats on your well-deserved victory! The photo was taken in CTBA Business Area Madrid. 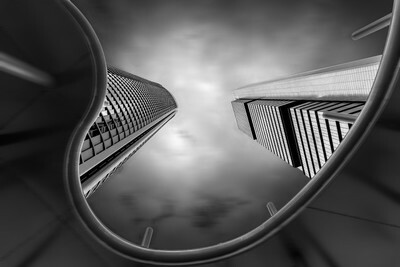 I love architecture shots, and here i encapsulated two towers in a nice curved frame. A winter evening appears with that special yellow light, more brilliant, warm, like a breeze of color that hug you image... i decided to go a place near of my house for using that special light. In my head the black and white edition was clear, the textures, curves and lines looks specially nice for architectural business places; Simply use the flow of the buildings and shadows for create a nice frame. I used a Nikon D7100, Tokina 11-16 2.8, Manfrotto tripod and ND filter. I simply flow the moment, what i feel when i was there for some minutes looking around and mixing with people and environment of the place. The photography starts in your head and flow from your heart through your hands. Normally i use a heavy processing form Nikon Capture, Lightroom and photoshop. First i use Capture for make a clear image and a balanced histogram. Then use lightroom for retouching the lights and shadows and finally i use photoshop for retouching, textures, details and sharp. My favorite and essential lens its a super wide, now im using a Nikkor 14-24 2.8. But some cheaper like this picture, Tokina 11-16 its good too. Also is necessary an ND Filter. A tripod and don't forget cleaning towels too! You just need to flow your hearth from the lines, feel the environment and practice new angles for shooting buildings, frame, from the floor... some different, shot a lot permits you discover new possibilities.